That’s the reaction I had after playing around with—or trying to—Intel’s RealSense camera, which Intel provided PCWorld and other journalists on Wednesday night. Intel’s RealSense is actually a family of different products: there’s the RealSense “Snapshot,” a camera mounted into tablets like the Dell Venue Pro 8000, which can be used for real-world distance measuring. And then there’s the RealSense 3D Camera (Rear R200) a rear-mounted 3D camera that looks purpose-built for a Surface or similar tablet. But that isn’t available yet, Intel says. RealSense is Intel’s “eye” into the world, a depth camera much like the Kinect camera that was designed for (and rejected by buyers of) the Microsoft Xbox One. It not only includes a video camera, but an infrared projector and laser to better intuit the real world. At the Game Developers Conference, CES, and the like, Intel has showed off a number of applications that take advantage of the RealSense cameras, from “scanning” your face onto a 3D avatar, to games that take advantage of gestures made with your hands. They can either be discrete cameras, or built into laptops and tablets. But like the Kinect for Windows, this is very early in the game. The hardware might be mature, but the apps are few, far between, and in some cases not fully formed. 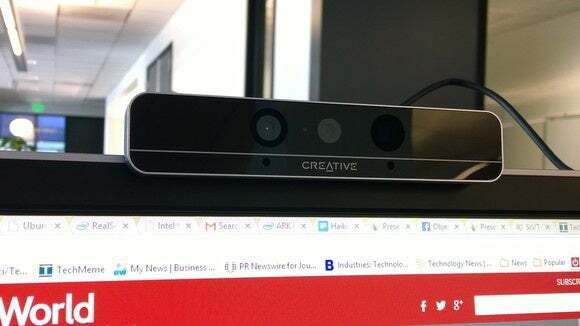 Intel provided PCWorld with the original RealSense 3D camera, also known as the Front F200, which carries the label from its designer, Creative Labs. (Remember them?) 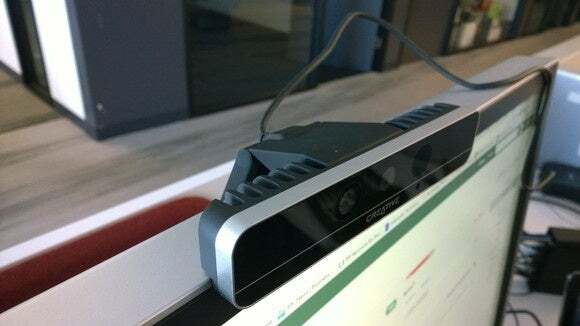 It flops over the top of your monitor or laptop, using a stiff hinge to balance and secure it. A USB cable snakes out the back to your PC. It normally costs about $100. 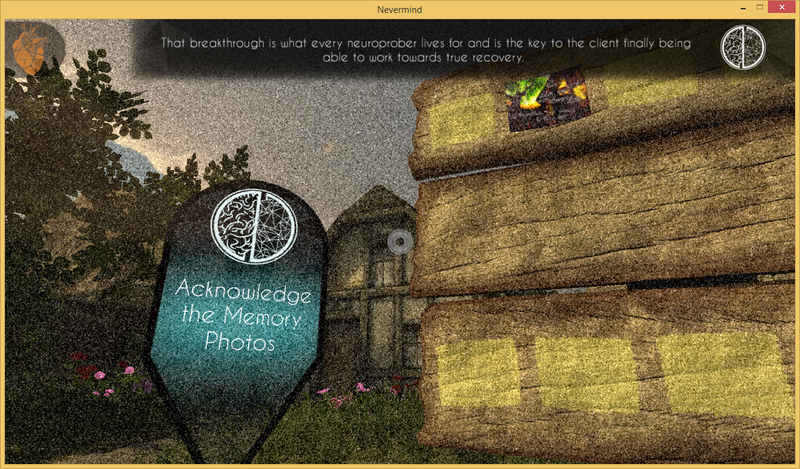 In NeverMind, you play a therapist delving through the subconscious of various patients, looking for clues to their trauma. Intel also provided alpha codes to NeverMind, a fascinating psychological horror concept game from Flying Mollusk that taps into the camera’s ability to “read” your pulse by examining your face with the infrared camera. Like Inception or The Cell, NeverMind puts you in the shoes of a therapist injected into the mind of the patient, where you root out buried traumas represented by photographs. There’s one catch: the RealSense camera can read your fear, and the game ramps up the difficulty the more scared or anxious you become: increasing the frequency of spikes, for example, or overlaying “static” on your field of view, making it more difficult to see. The idea is for you to learn how to manage stress, both in the game and the real world. The concept is an interesting one, playing off of a thesis authored by the game’s creative director, Erin Reynolds. Producer Michael Annetta explained that the original concept called for using a chest strap to track the user’s heart rate, but the RealSense camera was far less intrusive. 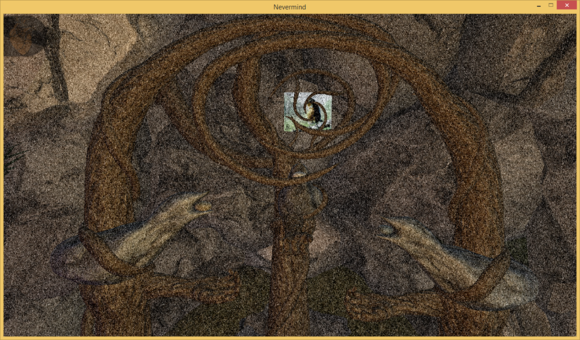 A NeverMind puzzle you must solve to proceed. In my brief playthrough, I found the game concept fascinating enough, although the RealSense camera seemed to hold the experience back. I’ll admit I was a bit nervous, and my “viewscreen” was quickly filled with static. I settled down quickly—after all, the tutorial level began in bucolic, peaceful countryside—but the static never went away until I restarted the game. I suspect that either the game didn’t poll the camera often enough, or else the camera couldn’t easily detect changes in my pulse. (Note that RealSense camera is designed to “read” you from 20 cm to 200 cm, or 7 inches to 47 inches away.) Restarting the game seemed to solve the problem. That’s not to say that those are the only apps available for the RealSense camera right now; Intel’s Perceptual Computing Challenge has helped commission games like Head of the Order, for example, where users can “cast spells” by drawing glyphs onto the screen. Intel also has a dedicated RealSense site where users can download a small number of games and other apps. The reason that this is important, however, is that Intel hopes to make the RealSense technology ubiquitous, replacing the common Webcams found in notebooks with its own, more sophisticated cameras. One can imagine a world where Cheetos-munching users navigate by waving their hands through space, rather than pawing a keyboard or the display itself. But as interesting as the NeverMind concept is, Intel needs to do two things: attract mainstream app support, such as a browser or productivity app, and offer a showcase or app store where users can try them out. I certainly don’t want to imply that Intel’s RealSense is dead or not worthwhile—not by any means. Intel did us the courtesy of providing us hardware that few actually have. But Intel clearly wanted journalists to walk away thinking that developers need to get on board and support the platform. We’ll agree. If RealSense is going to become mainstream, we need some mainstream uses for it. Updated at 2:09 PM with a link to Intel's RealSense app showcase.